JumpTo (free) aims to provide a faster way to launch programs and open files without using much in the way of system resources. A quick click brings up a simple JumpTo menu for launching programs, files, and Web pages. The tool pops-up a small menu in response to a few different hotkey combos, including clicking the right and left mouse buttons at the same time, ctrl + right mouse click, or ctrl + middle click. On the pop-up menu you'll see category listings for Folders, Files, Programs and Links. 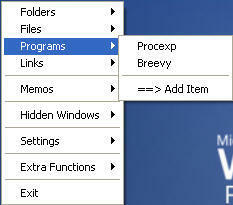 Under each category, an Add Item option allows for adding a program, file, etc. to the pop-up menu for easy access. Select a name for your shortcut and choose the folder, file or URL to point to, and you'll then be able to launch the item from JumpTo's menu. JumpTo also includes a simple memo-writing tool and an option to hide windows so that they don't show up on the task bar or desktop. Selecting the hidden windows from the utility's Hidden Windows menu will bring them back. Another extra allows running commands much like the Windows Run box. See JumpTo's online help for a good guide on using all the available features and hotkeys. The utility's creator emphasizes that JumpTo is "designed for speed and accessibility not for beauty and slickness." That approach pays off with a very small resource footprint. On my test system (with just a few JumpTo menu entries), the lightweight tool used only 3.8MB of memory. If you're after a no-frills customizable launcher, JumpTo may be the tool for you. If you want more eye candy, then you might like Stardock's ObjectDock.